Triumphing over nature’s grim and forbidding barriers, engineers are building a super highway linking Alaska and the Argentine. Here is the story of the greatest road project in history. 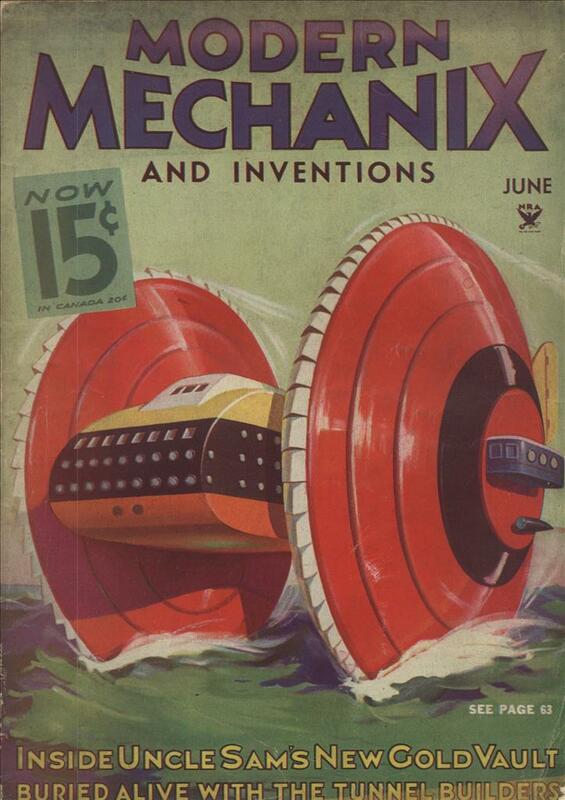 HACKING their way through tangled jungles, braving the quicksands of treacherous streams, hauling equipment by sheer man power up towering cliffs and over once impassable mountain ranges, dauntless engineers are bending every effort to bring the mightiest highway in all history to completion. The finished project will link two continentsâ€”a Pan-American roadway extending from northern Alaska to the southern Argentine. South American nations are pushing the work as rapidly as possible. Colombia has almost finished its section; Ecuador, Peru, Chile and Argentina are working on theirs. Hewing routes through certain sections between Mexico and Panama has not yet begun; but President Roosevelt has announced the willingness of the United States government to advance $600,000 to republics whose lack of finances might otherwise halt the work. United States engineers, under E. E. East, have already laid out most of the routes; and were first to fight their way through the high Barranca section in Mexico, which has previously cut off Mexico City from overland communication with the Mexican west coast. East and his men, facing untold hazards, fought their way through the hitherto impassable section, paving the way for one of the greatest road-building feats ever accomplished. The Americans entered the Barrancas a little beyond the historic Mexican town of Tepic and emerged on the Guadalajara side two days later. It was a spectacular performance, but the Americans did not rest upon their laurels. They were bound for Salvador, determined to conquer the jungle and prove that North America and Mexico might obtain highway connection with their southern neighbors. The demonstration was a success. Mexican officials were enthusiastic. Colonel Filiberto Gomez, governor of the State of Mexico, offered bonuses from his own funds to the heroic road workers. Solid peaks of rock barred their path. Deep chasms yawned before them. The terrain was a nightmare of natural obstacles. Heavy-duty road machinery could not be taken into the forbidding sector. The job had to be done with crow-bar, pick and shovel. Equipment and engineers’ cars had to be hoisted up the smooth-faced walls with block and tackle. It was a cruel, man-killing struggle every foot of the way; but the men triumphed and the Barrancas are now passable during good weather. Roads have been built from Nogales to Mexico City and from Laredo, Texas, to the Mexican Capital. A well paved highway extends from Laredo to Monterey. From there to the capital the road extends through rugged country and is impassable during most seasons. The Nogales route is not fit for travel during the rainy season in the summer months. In pushing her section of the international highway to virtual completion, Mexico has taken a great step forward in her own behalf. Overland communication between Mexico City and the west coast, once impossible, is nearing reality. Other nations were quick to follow Mexico’s lead. At the Pan-American conference in Montevideo last December the project was unanimously endorsed. 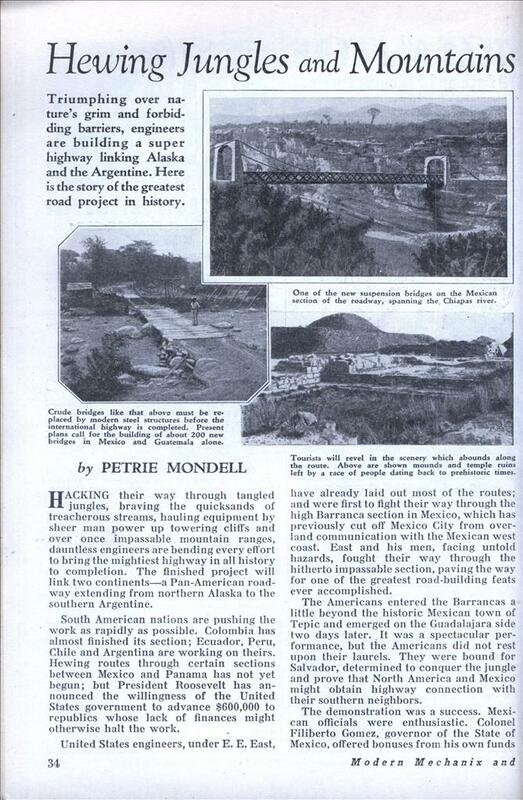 More than 400 South American newspapers adopted the road as one of the main planks in their editorial platforms. The potential value of this super roadway in the Pan-American scheme of things cannot be estimated. It will open up new areas to commerce, encourage international relations, provide emergency airplane landing fields and serve as a defensive weapon in time of Avar. Short wave radio stations will be established along the route, supplemented by mobile patrols, radio equipped. The route of the new highway is rich in historic associations. In places it proceeds over trails used by the Conquistadores and over roads laid down by the Aztecs and the Mayans. Paralleling the highway, engineers have found ruins so ancient that archeologists have been at a loss to classify them. Much work remains to be done before the last link in the international highway chain is forged. Pontoon bridges and ramshackle ferries must be replaced by modern structures. The roadway has been cut almost to the Panama Canal. With the exception of a 200-mile section from Panama to Sona, a short space between Remedios and David, a small strip between San Jose and San Ramon and a section between Las Canas and La Cruz, the highway is open to travel during the dry seasons. Another strip of 200 miles from San Jose in Costa Rica to the little town of Volcan is yet impassable but President Roosevelt’s offer of funds is expected to help complete the unfinished work. Within, eighteen months, authorities estimate, the great roadway will be open to the Panama Canal. The South American sections will require about three years to complete; but it is hoped that within five years the first inaugural caravans will start from Alaska, en route to the Argentine, to celebrate the greatest highway project in all history. The Pan-American Highway exists, but it doesn’t go through Seattle: it goes east of the Rockies through Calgary and Edmonton, then joins the Alaska Highway. And it still isn’t finished. There’s a stretch through the swamps on the Panama/Colombia border that block it.